RAMALLAH, (PIC)– Violent clashes broke out Friday afternoon across the West Bank after Israeli occupation forces brutally suppressed the Palestinian anti-occupation weekly marches. Hundreds of locals and foreign activists participated in the West Bank weekly marches demanding an end to Israeli occupation and settlement construction. In Ramallah, dozens of Palestinians marched in Bil’in town, east of the city, calling for an end to Israeli confiscation policy against their agricultural lands. The participants held Palestinian flags and raised photos of the Palestinian child Mahmoud Badran who was shot and killed by Israeli forces few days ago. The clashes broke out when IOF soldiers violently attacked the participants. No injuries or arrests were reported. In Qalqilia, Israeli forces suppressed Kafer Qaddum village’s weekly march that calls for the opening of a road closed by the IOF for more than 13 years. Local activist Murad Shteiwi said that Israeli forces fired teargas bombs and rubber bullets at the participants. No injuries were reported. The number of Palestinian prisoners sentenced to life imprisonment in Israeli jails has increased to 489 after Israel’s Salem Military Court issued new life sentences against four prisoners from Nablus, a new report revealed. The Palestinian Prisoners Centre for Studies said in a statement on Thursday that the Israeli court hands down life sentences against Palestinians accused of killing Israeli citizens or planning attacks that lead to the deaths of Israeli citizens. The statement added the prisoners with the highest number of life sentences are Abdullah Ghalib al-Barghouthi from Ramallah, who was sentenced to life imprisonment 67 times, followed by Ibrahim Jamil Hamid, who is sentenced to 54 life sentences on charges of leading the Ezzedine al-Qassam Brigades in West Bank and being responsible for many suicide attacks. The centre expected the number of prisoners sentenced to life in Israeli jails to increase in the coming period, since there are many Palestinians being prosecuted on charges of taking part in operations that led to the deaths of Israeli citizens. The Salem Military Court sentenced Yahya al-Haj Hamad, Amjad Illweiwi, Karam El- Masri and Samir Kousa on Wednesday to two life sentences and 30 years each regarding charges of shooting two settlers near Itamar settlement in October 2015. The Palestinian Authority President Mahmoud Abbas has said he had accepted the establishment of a Palestinian state on less than a quarter of historic Palestine in order to bring peace and an end to years of conflict. “The Palestinian Authority has been going round in empty circles through its negotiations with the Israeli side since the Madrid Conference and the Oslo agreement, in spite of the Palestinians sacrifices,” Abbas said. The Palestinian Authority president has renewed his support for the two-state solution and the establishment of a Palestinian state on the 1967 borders with its capital in East Jerusalem. Abbas also said that he “does not oppose some land swap on the condition of solving the refugees’ crisis according to the UN Resolution 194 and the Arab Peace Initiative”. 23 June 2016 – The recent “stuttering momentum” in delivering humanitarian aid to Syria’s besieged and hard-to-reach populations must be significantly expanded in the second half of 2016, the United Nations humanitarian chief told the Security Council today, warning that progress made to date was only “a trickle” of the country’s overwhelming needs. “There is something fundamentally wrong in a world where attacks on hospitals and schools […] have become so commonplace that they cease to incite any reaction,” said Stephen O’Brien, Under-Secretary-General for Humanitarian Affairs, in a briefing to the 15-member body. Violence continues unbridled in many parts of the country, he stressed. Indeed, according to the latest report of the Independent International Commission of Inquiry on the Syrian an Arab Republic, the Islamic State of Iraq and the Levant (ISIL/Da’esh) is committing genocide and multiple crimes against humanity and war crimes against the Yazidis in the east. In Aleppo Governorate, an ISIL offensive on Azaz and the surrounding area has led to numerous civilian casualties, threatening up to 200,000 of the population, and in Menbij, 45,000 people had been displaced and some 65,000 others were now encircled by the Syrian Democratic Forces. The cruel conflict continued to tear families apart and inflicted brutal suffering on the innocent, he said, recalling that, last week, at least six children had been killed and tens of others injured in heinous attacks near the Sayidda Zeinab shrine. Millions more are in the line of fire, facing crushing poverty and alarming physical danger. Children have been forcibly detained, tortured, subjected to sexual violence and in some cases executed. Some had been recruited by ISIL and other armed groups. Since January, some 844,325 people have been reached by the UN and its partners through inter-agency cross-line convoys, Mr. O’Brien reported, including reaching 334,150 of the 590,200 people living in besieged areas as designated by the UN. Nevertheless, major protection concerns, needs and suffering remain. There are now an estimated five million people living in hard-to-reach areas, an increase of over 900,000 people from the previous estimate. It is vital that the stuttering momentum sustained on humanitarian access over the past few months continued and improved, he said, expressing hope that by the end of the month all besieged locations will have been reached. “Organizing the delivery of aid must remain the responsibility of the United Nations and its partners based on need, and not subject to political or other considerations,” he stressed. The United Nations has submitted its July access plan to the Syrian authorities, requesting access to reach some 1,220,750 beneficiaries in 35 besieged, hard-to-reach and cross-line priority locations. That request had to be approved without any preconditions, stressed Mr. O’Brien, who is also the UN Emergency Relief Coordinator. “As I have said numerous times before, we remain committed and ready to deliver aid – through any possible modality including air drops – for civilians in desperate need, whoever and wherever they are,” he said, but stressed that the bottom line, however, is that the real extent of the progress cannot only be measured by ad hoc deliveries to besieged communities. 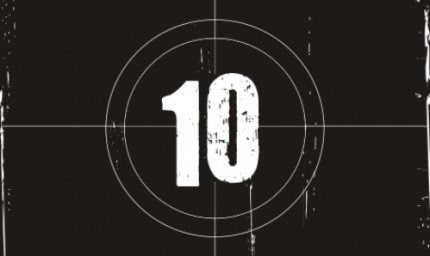 That dozens of barrel bombs were reportedly dropped on 10 June in Darayya – the day after the UN and the Syrian Arab Red Cross (SARC) delivered the first food aid to the town since November 2012 – shows that the situation for people in besieged and hard-to-reach areas will not be solved by humanitarian aid delivery alone. “The real measure will be when the sieges, these medieval sieges, are no more, when boys don’t risk sniper fire when bringing medicine to their mothers, when doctors can administer lifesaving treatments without the fear of imminent attacks, when Yazidi girls don’t have to scratch their faces out of fear of being bought and sexually enslaved. That is the disgusting reality in Syria today,” he concluded. Meanwhile in Geneva, Staffan de Mistura, UN Special Envoy for Syria, Jan Egeland, his Senior Special Advisor, and Yacoub El Hillo, UN Resident Coordinator/Humanitarian Coordinator for Syria, briefed the press on a meeting of the humanitarian task force set up by the International Syria Support Group (ISSG) – consisting of the UN, the Arab League, the European Union and 18 countries that have been working on a way forward since late last year. Mr. de Mistura said that the timing of resumption of the intra-Syrian talks would depend on the discussions he will have in New York and Washington in the coming days, and in particular the debate on Syria at the Security Council next week. He said he still hopes that the talks will resume in July. Mr. Egeland said that altogether, 16 out of the 18 besieged areas have been reached since the Task Force started work in February. The two remaining areas are Arbeen and Zamalka, both in rural Damascus, where humanitarian aid is expected to reach next week. But the Government has cleared aid for only a fraction of an estimated 40,000 people in those places. He said ISSG members are aware that humanitarian assistance is only alleviating the suffering of the Syrian people. “Besiegement is continuing, it should never be there in the first place […] it belongs in the Middle Ages, not in our time,” he said. Medical relief has not gotten much better. The main reason for people dying within besieged areas is because there is no medical service for easily preventable diseases, he said. For his part, Mr. El Hillo said that 13.5 million Syrians are in need of humanitarian assistance today, not all of them in besieged or hard-to-reach areas. The United Nations is very much on the ground, operating in different parts of Syria with a powerful network of both international and national partners who are also working from inside Syria but also from across the borders. But the international donor community must remember that “the cost of doing humanitarian business in Syria is very high because of all the complications and all the impediments,” he said, stressing that humanitarian appeal for 2016 is funded at 20 per cent. BETHLEHEM (Ma’an) — Israel’s Public Security Ministry proposed its latest bill to prevent “security” interrogations from being videotaped, for “fear the footage could reach terror groups that would learn Israeli interrogation techniques,” Israeli media said Friday.According to the Shin Bet, Israel’s internal security service, there is a “fear” that those being interrogated would refuse to reveal information in the event the video could possibly reach the groups they had informed against, said Israeli newspaper Haaretz.In 2003 a law came into effect that required Israeli police to document almost all its interrogations, both visually and aurally. “Arrested children are commonly taken into custody by heavily armed soldiers, blindfolded with their wrists tied behind their backs before being transported to an interrogation centre,” the CRIN report said. Some 42 percent say they signed documents in Hebrew, despite the fact that most Palestinian children do not speak or understand the language.Additionally, 22 percent of detained children say they underwent up to 24 hours of solitary confinement, in violation of international standards. 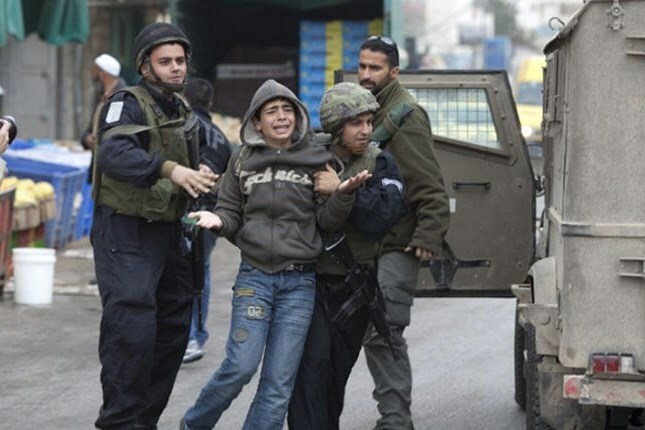 Some Palestinian teens reported that they were beaten to the point of their bones being fractured while being held in Israeli detention centers.In a report released in February 2013, the UN children’s agency UNICEF criticized Israel for its treatment of arrested Palestinian children, saying their interrogation mixes “intimidation, threats and physical violence, with the clear purpose of forcing the child to confess.”According to the latest numbers from prisoner rights group Addameer, there were a total of 414 child prisoners in Israeli prisons in May 2016, 104 of whom were under the age of 16. Morgen, zaterdag 25 Juni, breken met zonsondergang de laatste tien nachten van de Ramadan aan. Want morgen is de twintigste dag van de maand Ramadan en na zonsondergang breekt de 21e nacht aan. De 21e nacht is de eerste nacht van de laatste tien nachten. Deze tien nachten hebben een grote verdienste bij Allah de meest Verhevene. Het zijn de beste nachten van het jaar! Het was de gewoonte van onze nobele profeet vrede zij met hem om de laatste tien dagen, en met name de nachten, van deze gezegende maand extra goed te benutten. Hij was gewoon om op te blijven voor de aanbidding wanneer de laatste tien nachten aanbraken en maakte zijn vrouwen wakker zodat ook zij deze gezegende nachten in aanbidding doorbrachten. Het is niet bekend op welke dag deze gezegende nacht valt. Dit motiveert de moslim om iedere nacht van de laatste tien dagen goed te benutten. Wel is de kans groter in de oneven nachten en het grootst in de 27e nacht. Maar dat is niet zeker, zoals sommigen dat denken. De nacht breekt islamitisch gezien aan met zonsondergang en niet, zoals we dat gewend zijn, na twaalven. Ontneem jezelf deze grote beloning niet door een Taraweeh-gebed te missen in deze laatste tien nachten. Wij dienen deze smeekbede vaak te herhalen in deze gezegende nachten in navolging van het advies van onze nobele profeet vrede zij met hem en hopend op de vergiffenis van Allah. Deze smeekbedes kan je herhalen zoveel als je wil en je hoeft daarvoor niet in staat van (rituele) reinheid te zijn. Ook de menstruerende vrouw kan dus haar tijd hiermee goed benutten. Zo mag de menstruerende vrouw ook de Koran reciteren vanuit haar memorisatie of vanuit de moshaf, maar wel zonder direct contact te hebben met de moshaf. Ze kan de moshaf aanraken met de tussenkomst van een handschoen, doekje e.d. Of in plaats daarvan reciteert zij de Koran vanaf een scherm, zoals de smartphone, waarbij direct contact wel is toegestaan. Dan is de kans om daar verandering in te brengen nu binnen handbereik. Maak een voor jezelf haalbaar programma voor deze laatste tien en wees verheugd op een mooi einde van deze gezegende maand! Moge Allah ons allen bijstaan bij het goed benutten van deze gezegende nachten. OCCUPIED JERUSALEM, (PIC)– Defence for Children International – Palestine considered in a statement issued Thursday evening the Israeli murder of the 15-year-old Palestinian child Mahmoud Rafaat Badran as a ‘extrajudicial execution’ and not a mistake. Israeli officials have earlier opened an investigation into the shooting that resulted in the killing of Badran and the injury of four people, in a failed attempt to cover this and other crimes against Palestinians. The Israeli investigation claimed that the Palestinian child was “mistakenly” shot. In its statement, the DCI said that Israeli forces deliberately and not mistakenly opened fire at a Palestinian car, killing a child and injuring four others. Badran was shot dead by Israeli forces around last Tuesday after spending the evening at a swimming pool in the village of Beit Sira west of Ramallah with 4 other Palestinian boys, who were celebrating the recent arrival from Qatar of friends who were to spend the summer in their hometown of Beit Ur al-Tahta. An Israeli soldier began showering the car with live fire, according to local sources, killing Badran and seriously injuring the four others in the car. 15-year-old Badran was laid Thursday evening to rest in his village of Beit Ur al-Tahta near Ramallah in the occupied West Bank. Badran’s funeral procession started from the Palestine Medical Complex in Ramallah where Badran was then taken in an ambulance to his hometown village of Beit Ur al-Tahta, followed by dozens of cars. Thousands of residents from Beit Ur al-Tahta and surrounding villages waited for Badran’s body at the entrance of the village, and then marched behind the ambulance until he got to his family’s home. After his family said their goodbyes to him at the house, he was taken to his school and then to the village’s mosque where worshippers prayed for him, after which he was taken by thousands of mourners to the village’s cemetery, where he was laid to rest. Badran is one of more than 220 Palestinians who have been killed by Israeli forces and settlers since October 2015. Days of Palestine, West Bank -Israeli occupation executed 18-year-old Palestinian mother on Friday afternoon near the West Bank city of Al-Khalil. The mother was identified as Majd Likhdour from the village of Bani Na’im while the incident took place at Elias Junction, located at the entrance to illegal Israeli Jewish settlement of Kiryat Arba in Al-Khalil. While the Israeli occupation had accused the Palestinian woman of trying to carry out a car-ramming attack near a railway station, eyewitness refuted the claims, stating that was an accidental collision. “It was a mere car accident and it was far away from the railway station, which the Israelis claimed she wanted to hit,” Lo’ai Ja’bari, an eyewitness, told Days of Palestine. “The damage caused to the cars proves that it was not an intended accident,” Ja’bari said while weeping as he recalled the scene. “As soon as the Israeli soldiers at the Elias Junction knew she was a Palestinian woman, they showered her with live bullets,” he added. Majd was a mother of a nine-month old baby girl, who is now orphaned and will never see her again. In this accident, two Israelis were lightly wounded. Palestinian President Mahmoud Abbas stated during a press conference in Brussels, on Wednesday evening, that the Palestinian Authority supports the “French Initiative,” and all the efforts by the European Union, aiming at reaching a comprehensive peace agreement. His statements came during a press conference with Federica Mogherini, the High Representative of the European Union for Foreign Affairs and Security Policy, Vice-President of the European Commission. 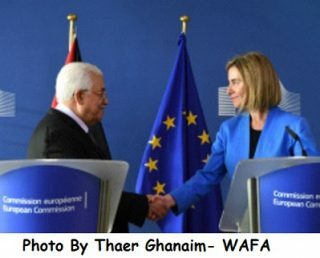 Abbas expressed his gratitude to the European Union for its continued support to the Palestinian Authority, and thanked France for its efforts to reach a comprehensive peace agreement in coordination with European countries. The President also thanked the Quartet Committee, Arab countries, and all states that participated in the Paris conference earlier this month. Abbas added that if Israel is really interested in peace and security with the Palestinians, and all Arab neighbors, it must end its illegal occupation, and its escalating violations. GAZA, (PIC)– The Israeli occupation sent threats to the organizers of the Resistance Festival in Greece over the participation of activist Leila Khaled, from the Popular Front for the Liberation of Palestine (PFLP). Member of the PFLP political bureau Leila Khaled arrived in Athens on Thursday to take part in the annual Resistance Festival. A statement by the PFLP said the Tel Aviv Embassy sent official protests over Khaled’s stopover in Athens and exerted pressure to ban the festival. Residing in Jordan and an icon of anti-occupation activism, activist Leila Khaled took part in hijackings of Israeli warplanes in 1967 with the aim of releasing Palestinian captives.